On average, our ecommerce customers triple the number of emails they capture when they set up email popups. They’re still the number one way to build an email list, and I’m not the only one to notice the impact of popups. But, as with any list-building technique, popups require some experimentation and practice. Some of our customers turn 3% of their visitors into subscribers, some others 16%. 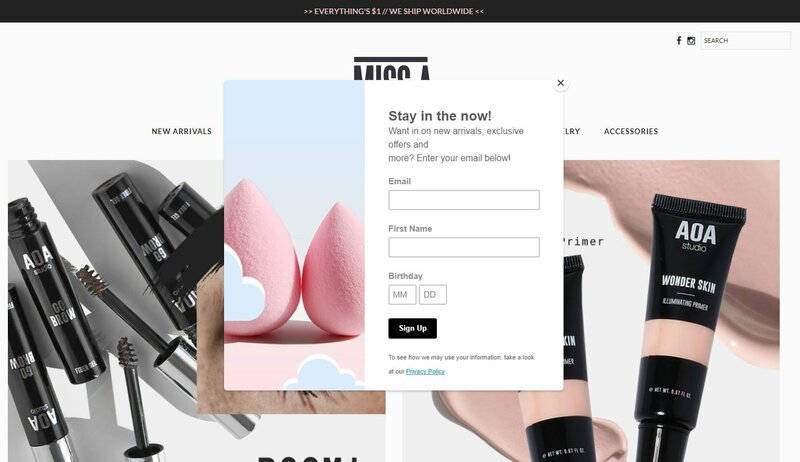 In this article we’re going to review the basics of email popups and show you different ways to make them work for your store. Editors Note: There’s lots of free and paid popup options available. 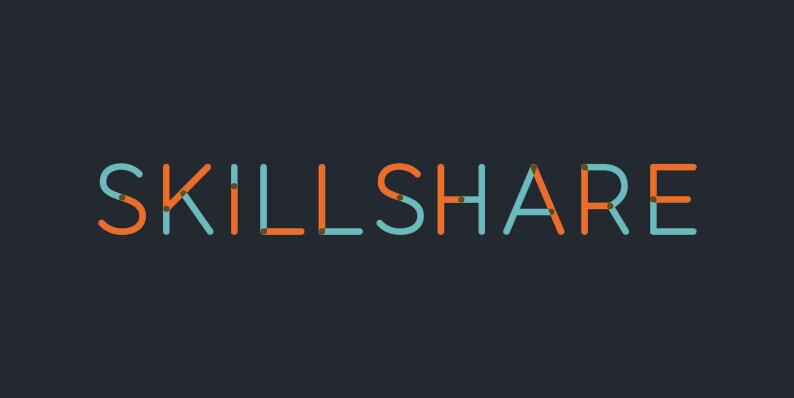 To begin, check out Hubspot’s Pop-up Forms or Wise Pops. In Shopify’s own words, “Email marketing is the key to ecommerce success.” Why? Because email is one of the best ways to retarget your visitors. sessions—and 25 days—to complete their first transaction.” In other words, the chances of converting a first-time visitor are quite low so to turn a new visitor into a buyer, you’ll have to drive them back to your store. To do so, you have only 2 options: Emails and retargeting ads. Let’s see why emails are an ideal option. First, because we tend to trust emails more than ads. According to research by Criteo, a leading retargeting platform, the average click-through rate for retargeting ads is 0.51%. On the other hand, the average CTR for emails ranges between 4 and 14%. In other words, internet users are 26 times more likely to click an email than they are to click a retargeting ad. If you agree that email marketing must be one of the pillars of your ecommerce store’s success, one of the most pressing questions you should ask yourself now is: How am I going to convince these visitors to subscribe to my email newsletter? Don’t worry, I have a few suggestions for you. 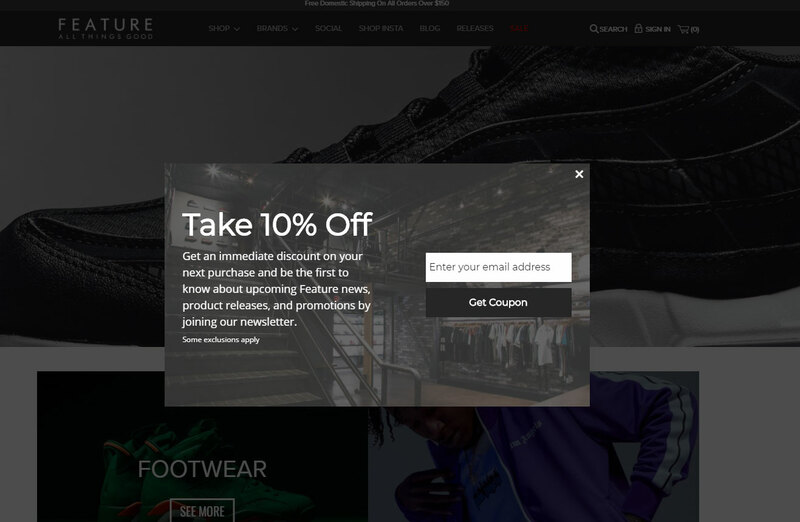 The first and easiest way to collect emails is to add a newsletter signup form to your store’s homepage. It only takes a few seconds and doesn’t involve any additional spending. You’ll find directions on how to do it in Shopify’s FAQ. The problem with traditional signup forms is that they don’t work that well. Take this case study from AWeber for example: Their signup form subscription rate was only 0.4%. So, why do signup forms perform so badly? Firstly, because most of the time their placement on a website makes them almost invisible. A vast majority of ecommerce store merchants tend to put them in the footer of their website and that’s a part most visitors never get to see. Only one in two visitors scroll further than 1000 pixels. Secondly, because their design isn’t very attractive. Space is scarce in the footer, too scarce to add graphics or to design a visually impacting form, so even if these forms are seen they’re often simply ignored because they’re not visually compelling. Is there any way we could overcome signup form limitations? YES! Let me introduce you to email popups. Using popups to embed your forms allows you to position your form anywhere on the page, maximising the chances that your users will see it. 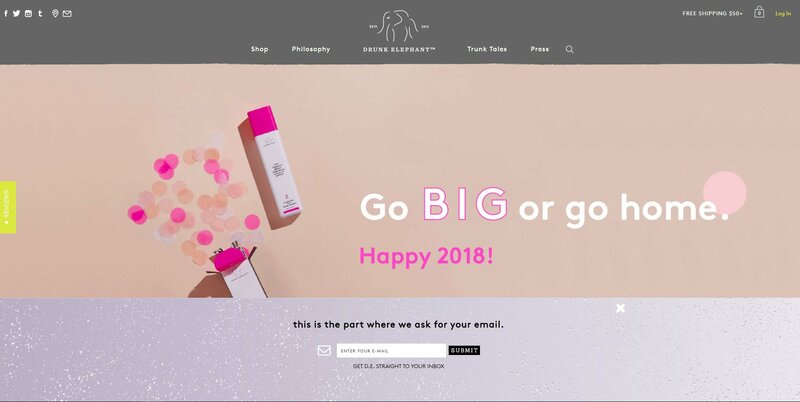 Let’s take this example from the brand Drunk Elephant: The email signup form is no longer hidden in the footer, it’s right in front of the user (who can’t miss it). Email popups also come with a lot of targeting capacities: The signup form doesn’t just have to be displayed by default on all pages no matter what your user’s behavior is like on your website. Here’s a good example of targeted popups from Dose of Colors’ website. This popup is displayed right before the user leaves the website. Finally, popups offer you a way to share a real message. If we stick to the Dose of Colors example, you can see that they’ve added some copy to convince you to subscribe. And, as they control the targeting, this message can be adapted to suit each user’s context so the popups don’t get repetitive. But, how do these advantages translate in terms of results? Our average subscription rate with email popups is 5.9% and I often come across ecommerce websites who achieve a better performance. Take this Shopify store for example: They turn one in five new visitors into a newsletter subscriber. But again, setting up a popup is not enough. It needs to be optimized. Let’s see how. To prepare this section, we’ve reviewed about a hundred Shopify websites and crawled through dozens of our clients’ accounts. Ready? Let’s review the characteristics of a good popup. In an ideal world, your visitors would subscribe to your newsletter simply to please you. They wouldn’t ask for anything in return. By adding a $7 discount to his popup, this merchant was able to quadruple his subscription rate. But, adding discounts is not always the best option. You need to identify what will speak best to your audience (and won’t burn your entire marketing budget). If you’ve ever built brand personas for your store, it’s time to use them. What drives your visitors? Are they bargain hunters looking for the best deal? People looking for a specific product but also interested in learning how to use it? Visitors wanting to have fun? To help you find the ideal offer, here a few suggestions. We also like this example from Alpine Laboratories. They don’t even mention their product, they just offer their subscribers the chance to learn something. You can offer a discount code or a free shipping code (that’s what 80% of the Shopify stores we’ve reviewed do). You can also offer your potential subscribers an opportunity to win something. The brand Dropps, for example, offers visitors the chance to win one year of supplies for free. If you’re unsure about what you could offer your visitors in exchange for their email addresses, set up an AB test and check what kind of offer brings the best results. I won’t repeat this tip over and over but it applies to the subsequent steps as well. There’s no one-size-fits-all format for email newsletter opt-in popups. Let’s review your options and when they work best. As such, they’re highly intrusive. We recommend using them just before exit only otherwise you may risk increasing your bounce rate and affecting your conversion rate. They allow you to get maximum exposure (most of your visitors will only see one page on your website, thus qualifying to see your popup) while keeping your visitors free to continue browsing. Popup bars are interesting on landing as well. You can also try displaying them on a few subsequent pages if they don’t take too much screen estate. This way you can multiply your exposure to your visitors. 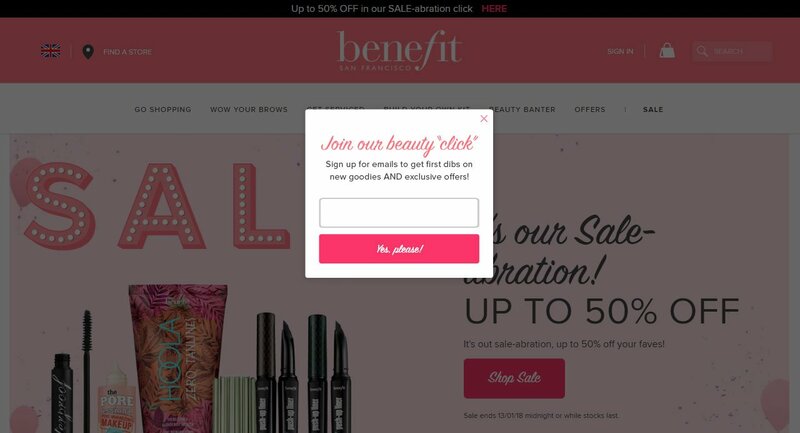 These popups are associated with a call-to-action or teaser displayed first. The “real” popup appears only when the visitors click it. CTA popups are especially popular on mobile websites where they don’t take up too much screen estate and are compatible with Google’s recommendations on mobile interstitials. Make it blend into your website: Your popup should be part of your website to avoid it being mistaken with an ad or external content. 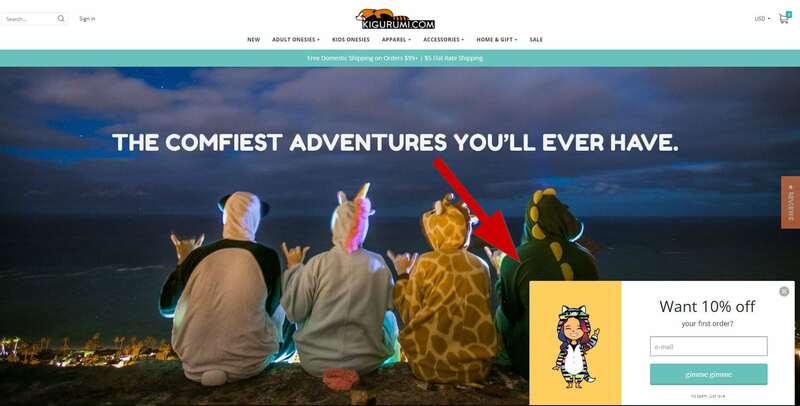 Make it stand out: Your popup should be visible enough to pique your visitor’s interest. Let’s see how these principles translate into reality. 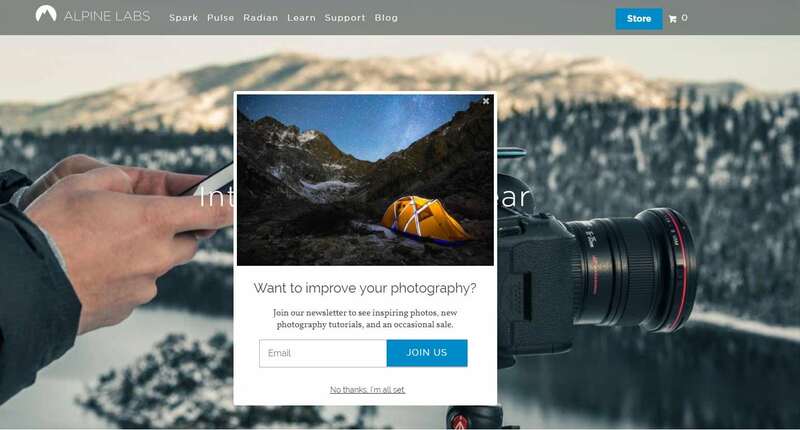 Using visuals is one of the best ways to turn an annoying newsletter form into a stunning email popup that converts visitors. Fonts are a major aspect of your website’s identity (and for good reason) so make sure to use your own font in your popups as well. It’s the best way to keep your popup coherent with the rest of your website and brand. Note: Find fonts for your ecommerce business and other important visual assets in our 200+ Graphic Design Resources article. Your call-to-action button needs to be easily seen by your website visitors to increase their chances of signing up so we recommend picking a color that contrasts against the background of the rest of the popup. 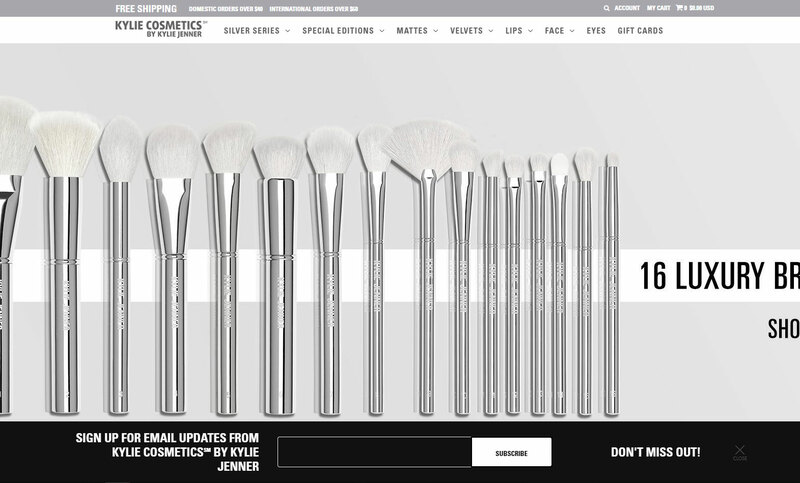 A good example of this can be seen on the aforementioned Kylie Cosmetics website: See how the “Subscribe” button’s white background helps it stand out from the rest of the bar? 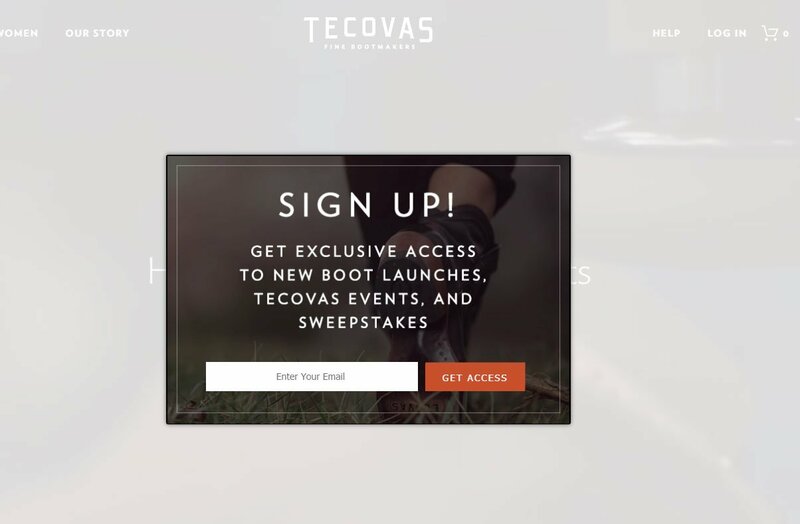 The same goes for this popup from the brand Tecovas. Using orange for the CTA button against more muted colors makes it unmissable. Do you think you should force your users into subscribing? If so, you’re probably pursuing a dangerous path that will alienate more visitors than entice them. If you think a good user experience allows visitors to stay in control, then stay with me and listen. Closing options are crucial when it comes to popups. 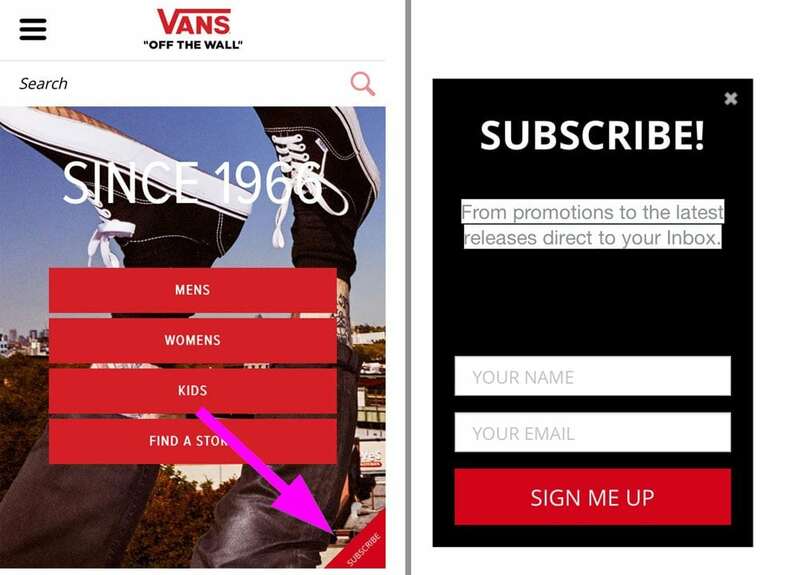 They give a way for your visitors to express their intention not to subscribe and pursue their navigation on your store. In general, we recommend using at least one very visible closing option. 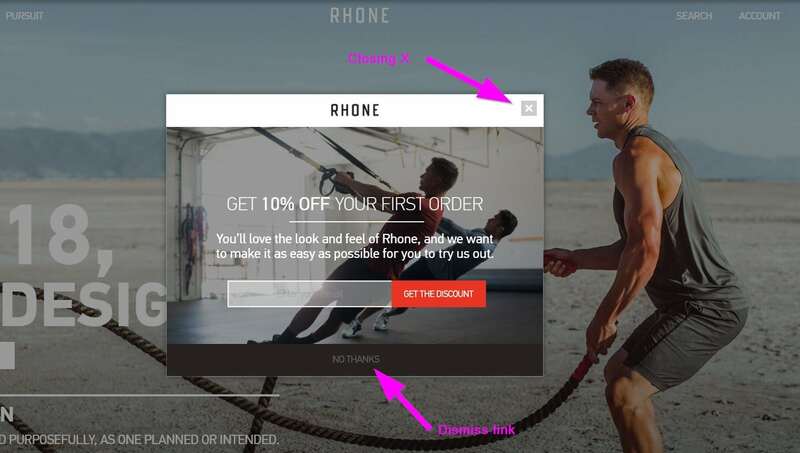 You can also, like the brand Rhone is doing, offer 2 closing options (that’s especially relevant on intrusive popups like lightbox popups). Let’s review them in detail. But you can also use other methods. For example,this brand uses a sense of exclusivity in their popups. It’s as if you were joining a secret group. Another option you can use is humour. This is what the brand Lush does with their tounge-in-cheek headline for their email popups. What could prevent a user from subscribing? 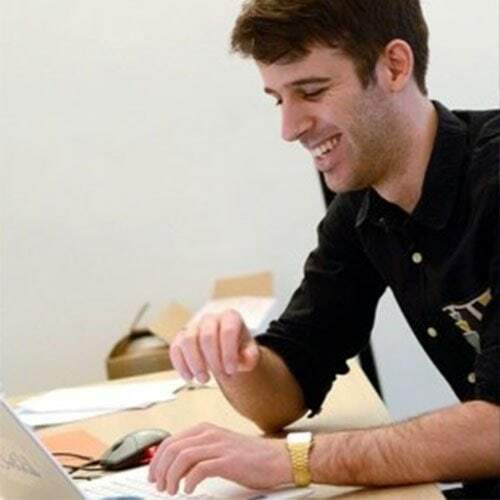 The chance that they may receive an influx of promotional emails or have their email address sold to a third-party and open their inbox up to spammers. Your popup text should remind your visitors that their email address is safe with you. We won’t share your email with any one. We’ll only send you one email per month. Email popups have one major limitation (which doesn’t apply to bars and CTA), they’re only displayed once per session. So, as a marketer, you’re in a situation where the user subscribes now or will probably never subscribe. In other words, you must be able to convert the visitor as soon as they see the popup. To do so, you can rely on FOMO, the fear of missing out. First, by using words that inspire a sense of exclusivity. With adjectives such as “exclusive”, “limited”, or “private” you can suggest that this offer is not available to just anyone and, most importantly, that it may not be offered again. Speaking of one-time offers, driving a sense of urgency can also help. What better way to convert visitors immediately than by convincing your users that he or she won’t see such a generous offer any time soon? To further reinforce the urgency, you can add a countdown timer inside your popup. This is especially useful when your popup offers a seasonal deal. Choosing the right timing is difficult. Let’s take this AB test ran by one of our Shopify customers which illustrates the difficulty of choosing the right timing. But at the same time, the longer they wait, the smaller the population of visitors actually seeing the popup is. So in the end, the popup displayed after 40 seconds collected fewer emails than the one displayed after 10 seconds. A different customer ran this test where he tested a popup displayed on the landing page vs. a popup displayed on the third page viewed. Again, the more they waited before displaying the popup, the better the engagement rate was (+104%). But the more they waited, the fewer emails they collected (-63%). It’s difficult to find a balance between reaching too many visitors with the risk of annoying some of them (if 3% of your visitors subscribe then it means you displayed an offer which didn’t interest 97% of them) and waiting too long, taking the risk of reaching only a limited number of visitors. But again, there’s a solution. If you want to avoid spending hours identifying the best timing, you can rely on exit-intent popups. Exit-intent popups trigger automatically when your visitor is about to leave the website, which means you don’t have to choose when your popup will appear. Among our customers, the subscription rate of exit popups is on average 5% higher than those of popups displayed on page load. This shouldn’t come as a surprise: A visitor about to leave is not interrupted by your popup and they don’t have anything to lose. Exit popups are a first option. If you really don’t want to choose, you can also use call-to-action popups displayed on every page of your website. This way, it’s up to your visitor to choose when he or she wants to see your popup. 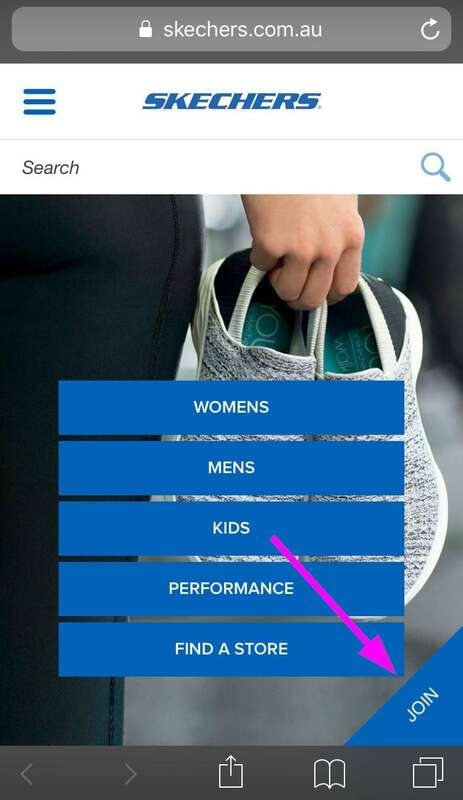 Our experience with CTA popups is limited on desktop, but on mobile devices we’ve recently done a test with Skechers. Their call-to-action popups ended up collecting +48% more emails than their popups displayed on page load. 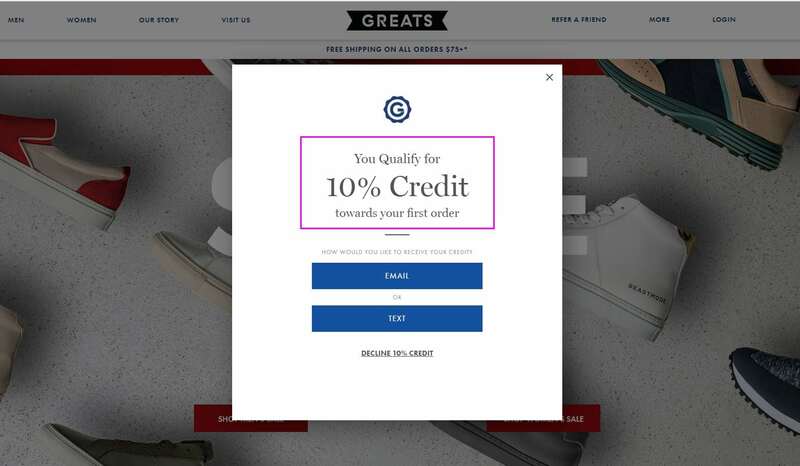 That’s all the basics you need to know about how to implement email capture popups for your ecommerce store! Don’t forget the most important thing: Always AB test your popups. Our customers at WisePops have run hundreds of AB tests and the results have often been mind-blowing. It’s also one of the only ways to make sure your campaigns are always optimized for your website visitors. Happy list-building! Greg is head of Customer Success at WisePops. You can find the WisePops popup app on the Shopify app store. Thank you for posting this article. These ideas are indeed helpful for better marketing of our business.